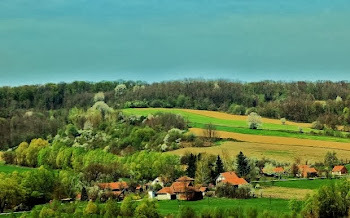 For the basic history of the location of Iron Bridge originally published back on May 19, 2014, entitled "The Meeting Of The Townships" please click on the link provided. Page 249 of the book by Franklin Ellis about Fayette County History quotes a 1788 petition for a road from present-day Connellsville to present-day Iron Bridge: "Road from Zachariah Connell's to Isaac Meason's, on Jacob's Creek." The bulk of information included in the above mentioned article on "Fayette/Westmoreland Forgotten History" involved the naming of the road, some of my personal observations about growing up nearby, which relates to the trolley and railroad, but the main thrust concentrated upon the earliest bridge, the original structure envisioned by Judge Finley. Later, I will supplement Mr. Dietle's fresher data, some of which is covered to an extent piecemeal in various recent posts, but not with the systematic and in depth form given below. Here I wish to correct, or adjust, one misleading idea presented in that post where I had stated the area of the Great Swamp encompassed the Iron Bridge location with extension into nearby Hammondville to the northeast. How much this enerally included Iron Bridge and beyond the Greenlick area to the south and east, was basically speculation mixed with some experience on my part, largely arrived at from 1939 black and white photos taken from Penn Pilot and traditions of old timers with earlier study of the broader water flow of Jacobs Creek and amount of accumulated swampland. My point is, there was some conjecture involved. The depth and extent of the waterway has clearly dropped a fair degree in my own lifetime, whatever the explanation construed by this fact. I would therefore add one plausible concept as an example for the Turkey Foot and Braddock routes diverging from the key area north of Pennsville and not using this sensible route, might refer to a particularly boggy region that, perhaps encumbered those miltary efforts a good deal in discouraging travelers until the undertaking to build the chain bridge. Of course, this hardly can explain the Hammondville route for the Braddock army for an obvious well earned reputation as the main location of the Great Swamp. As Rodney Mosler of Uniontown wrote about a tradition of the 'TFR' traversing over Walnut Hill and crossing Jacobs Creek at Dexter, and Veech who has made statements toward this area for path of this old road, this might reveal a need to avoid this low lying swamp, yet it is reasonable to consider there may remain other more legitimate explanations as to why these routes did not travel directly through what later became known as Pennsville, or the Great Road. The answers are still, ultimately, unknown at the present day. There is a sore need that cannot be overstressed for the renewed discovery of these ancient roadways and their intended directions as to their extremely meaningful place in the formation of the villages and development of the townships of Upper Tyrone, Bullskin, Mt. Pleasant and East Huntingdon, straddling the counties of Fayette and Westmoreland here in Southwestern Pennsylvania. Again, all the facts are not fully understood by any means. Consideration could allow for an assertion of the theory of Indian paths diverting from the Catawba Trail as being partly responsible for helping to coose these differing routes on the frontier. More information can be gathered from the post on "The Braddock and Turkey Foot Roads..." with some key conjectures and ideas not all necessarily yet confirmed. "The same page 249, (of Ellis' History of Fayette County), mentions a road that seems to have been petitioned for in Westmoreland County before the founding of Fayette county, that was to run from Stewart's crossing to Uniontown, and on to the Cheat river. The Fayette county book isn't clearly written, and seems to be saying that after the Founding of Fayette County, Fayette County ordered the completion of the portion between Uniontown and the waters of the Cheat River. Maybe the road is mentioned in the Westmoreland County history book". 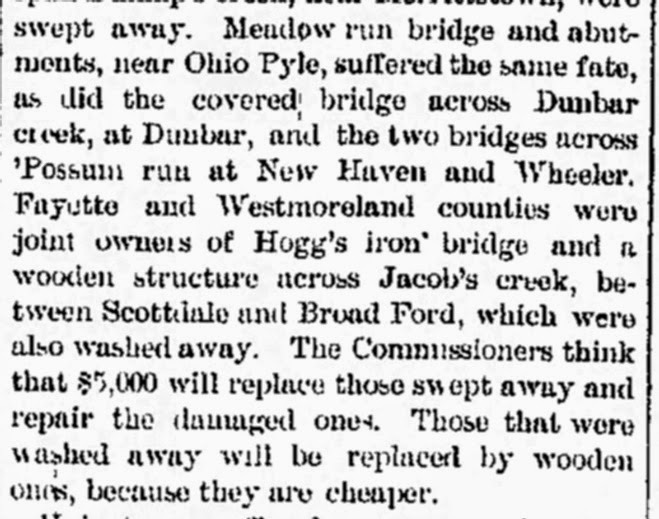 "Page 485 of the fourth edition, (from his book, 'In Search Of The Turkey Foot Road'), quotes from an 1802 article about the chain bridge 'near Judge Mason’s, on the great road leading from Uniontown to Greensburg”. This “great road” is interesting to those who study the Turkey Foot Road because it crossed Jacobs Creek between two other early fording sites: The locations where Braddock’s road crossed Jacobs Creek, and the location where Veech indicates the Turkey Foot Road crossed. It is difficult to understand why Braddock’s road swung so far east to cross, or why the Turkey Foot Road swung so far west to cross, when they could have both taken a more direct northerly route, crossing Jacobs Creek at the fording site that was used by the great road before the chain bridge was built. This fording site was at or very near the site of present-day Iron Bridge, Pennsylvania. The origin of the great road deserves to be studied. Ellis’ 1882 book “History of Fayette County, Pennsylvania” provides a clue in the form of a 1788 petition for a “Road from Zachariah Connell's to Isaac Meason's, on Jacob's Creek.” This is interpreted as being a petition for a road between the present-day sites of Connellsville, where Zachariah Connell once lived, and Iron Bridge, Pennsylvania, which is located across the creek from where Isaac Meason once lived. The first road viewed and laid out by order of the court of Fayette County, in December, 1783, was that from Uniontown to the mouth of Grassy Run, on Cheat River, this being part of a road which had been petitioned for to the Westmoreland County Court (before the erection of Fayette), to run from Stewart’s Crossings (Connellsville), through Uniontown, to the Cheat. It was ordered to be opened, cut, cleared, and bridged, thirty-three feet wide. Broad Ford is in the immediate environs of Connellsville. Taken together, these 1783 to 1788 petitions call for a new road between Uniontown and Iron Bridge, Pennsylvania. Such a road is shown on the 1792 Reading Howell map, and is interpreted as being the "great road" referred to in the 1802 article. Whether this road was preceded by an earlier path is unknown. If Veech is right about where the Turkey Foot Road crossed Jacobs Creek, the Turkey Foot Road had to cross over Braddock’s road south of Jacobs Creek, before merging with Braddock’s road in the environs of Mount Pleasant. It seems extremely likely that the place where the two roads crossed would have been very close to where the great road ran through. In other words, the three roads probably formed something roughly akin to a six-point intersection—if not literally, then at least functionally. If Veech's Dexter-area Jacob's Creek crossing site is accepted as valid, the Turkey Foot Road ran generally west-northwest from Wooddale to Dexter— which may have brought it through somewhere roughly in the vicinity of present-day George’s Trading Post. Braddock’s Road ran north-northeast from the western end of Country Club Road (near present-day George’s Trading Post) to the Hammondville area. The great road ran from somewhere in the general vicinity of the western end of Country Club Road to Iron Bridge. From the approximate location where Braddock’s road and the Turkey Foot Road intersected, the great road was a much more direct route north to Mount Pleasant. As such, it can be thought of as a shortcut to both roads, and may help to explain the eventual obsolescence of both roads in this area. This “shortcut” concept may help to explain a strange annotation on an old document that Al Wilson identified—but until Mr. Wilson publishes his discovery, this Addendum will remain silent on the matter." Now, this strange annotation Mr. Dielte specifically refers to in his closing remarks are the odd markings of the 'Old Braddock Road' from the 1757 Westmoreland County Barker Map that deviates from the location near Iron Bridge parallel to the west near Sherrick Run, in a previously unknown course toward the vicinity of Mount Pleasant. For those that haven't read it, here is a link to the whole article that was being awaited, " A Scoop On The Old Braddock Road..." I only hope this was worth the exercise in patience, but this doesn't directly concern the present post. Mr. Dietle has recently stated he "suspects that the route shown on the 1857 map may have been referred to as the “Old Braddock Road” because it served as a shortcut to an earlier section of Braddock’s Road”, while he also observes by way of a letter from Washington to his brother John, there was a fairly severe drought in Pennsylvania in the summer of 1754 during the Braddock campaign. This is clear from his further statement that, "we now found the Great Crossing of the Youghiogany, which may be passed dry-shod", leading to the conclusion Jacobs Creek was not in itself a serious problem as to the choice of fordings, and yet the bivouac near Hammondsville necessarily took some time and effort, keeping in mind, the condition of the swamps was therefore still a serious encumbrance to be overcome. While the thoughtful culmination the author has provided above is much appreciated, I want to further broaden the scope with some historical recollections from old newspaper archives. 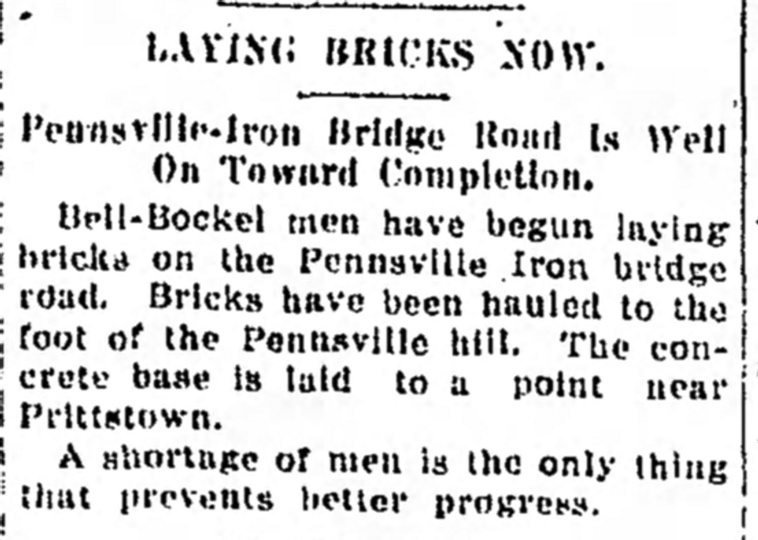 These mostly concern details of the Pennsville to Mt. Pleasant Road, or as somewhat erroneously called 'Old 119', with examples of the danger of the location and the conditions highlighting a handful of tragic deaths that once took place at Iron Bridge. NOTE- With the following click-able vintage newspaper articles from the Daily Courier you can read this information for yourselves. The above refers to one of many old time floods, this one was on .Aug. 31, 1888. Whether this suggests the early iron bridge or another that was washed away, it is said they will all be replaced by wooden structures. With the swirling backwaters, thick mud and occasional treacherous sink holes, this was indeed, and sometimes can still be a dangerous waterway. I am personally acquainted with a few people who barely survived the swamps on their own. So, do be careful in this region and you should come out fine and dry. 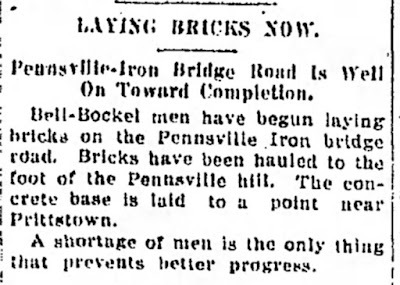 The above article is from the year 1919 and claims the submerged vehicle was caught on the old iron bridge which was said to still remain at the bottom of the creek! According to the 1758 map from The Gentleman's and London Magazine, Jacobs Creek once went by the earlier name of Terapin Creek. The chain bridge was built in 1802 and replaced after 1833 with a wooden bridge. The iron truss bridge, for which the site is named, was built in 1863, probably a ways to the east of the present bridge. The Mt. Pleasant and Broadford Railroad Station use to be here on the south bank of Jacobs Creek. As always, any comments or responses are welcomed, so let me know if you found this article interesting. A happy beginning to our Summer!